A solid day for the Lotus team as they began their second season in Formula One. The programes for both Jarno Trulli and Heikki Kovalainen were completed as planned despite fuel pressure and electronics problems, respectively. Karun Chandhok: "I'm obviously disappointed to have had such a short run for my first time in the Team Lotus car, but I put my hands up to it and totally accept it was a combination of a slippery track and less grip than I expected from the tyres that combined to put me out so early. I'm just pleased the guys could get Jarno out in the afternoon session and it shows what a great team this is that they could get the car fixed that quickly to ensure Jarno could get a decent number of laps under his belt in FP2." 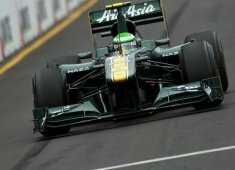 Heikki Kovalainen: "It was one of those days. We had a couple of problems the guys worked hard to resolve, and once we had got through the issues we managed to complete most of the program so we have some good data to work through tonight. There is obviously more pace to come from the car so let's see what happens tomorrow." Jarno Trulli: "The team worked really well to get the car ready for the afternoon session but we struggled a bit with a few issues that meant I couldn't really push. We'll work tonight on setup options and there are definitely some areas to look at where we can find some pace so I think tomorrow we'll be ok."
Thierry Salvi, Renault Sport F1 Support Leader: "Engine wise it was quite a good day because we managed to carry out a number of tests we had not completed in the pre-season running. We have had some positive feedback from the drivers from those tests, for example with the blown-floor strategy, so this has been a pretty encouraging day for us." Mike Gascoyne: "A difficult first day in Australia, although we managed to complete some good work at the end of FP2. At the start of FP1 Karun was caught out by the slippery conditions and made a mistake which unfortunately curtailed his running. In the second session we had a fuel pressure problem on Jarno's car and an electronics issue on Heikki's car, both of which limited our running, but we were able to solve those issues and work through most of the afternoon's plan. For tomorrow there is a lot more to come from the car. We are clearly not quite where we expected to be in performance terms but we understand the reasons for that - it is proving quite tricky for us to get the best out of the tyres but we will work on that tonight and when we improve I am confident we will move up to where we expect to be in qualifying tomorrow." Tony Fernandes: "It is good to be back racing and very satisfying to see our green and yellow vision coming together on and off the track. It was one of those days that are not so good for us but this is a continuous journey and while we have work to do I'm confident we are moving in the right direction for the year ahead. It is a real mark of where we are now that the comments from the rest of the team are expressing disappointment with today. As a Team Principal it is actually very pleasing to hear that a performance that a year ago we would have been thrilled about is now being seen as us not meeting our targets, and that shows us all just how far we have already come. The team may not see it right now but this is huge progress, so I am happy and looking forward to the rest of the weekend."